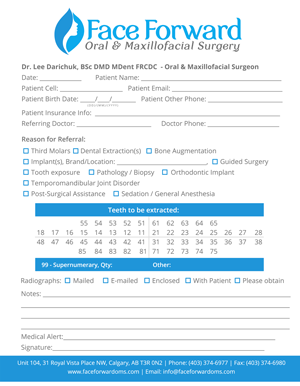 Dr. Lee Darichuk and his team want to proudly welcome you to our new NW Calgary Oral & Maxillofacial Surgery facility. 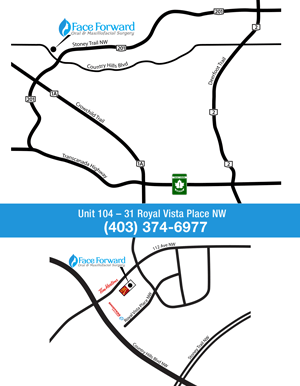 For your convenience, we are located in Northwest Calgary with easy access via Stoney Trail NW and Country Hills Boulevard NW. We share a ground floor location with the CIBC bank in the in the Royal Vista Professional Centre complex, located at 31 Royal Vista Place NW, Suite #104. Our facility is wheelchair accessible with ample free parking. Click here to download directions to our office. From the moment you walk into Dr. Darichuk’s practice, you will recognize the attention to detail and planning put into everything that we do. Our goal is to cater to the comfort and needs of each and every one of our patients. We are committed to making your time with us safe and positive from the first time you visit. As an accredited Non-Hospital Surgical Facility with the College and Physicians and Surgeons of Alberta and accredited Dental Surgical Facility under the Alberta Dental Association and College, we are pleased to offer solutions for your comfort including intravenous sedation and general anesthesia (commonly referred to as, “Sedation Dentistry,” and, “Sleep Dentistry”). Together with Dr. Darichuk, our professional team of anesthesiologists and nurses are ready to make your Face Forward experience a positive one. 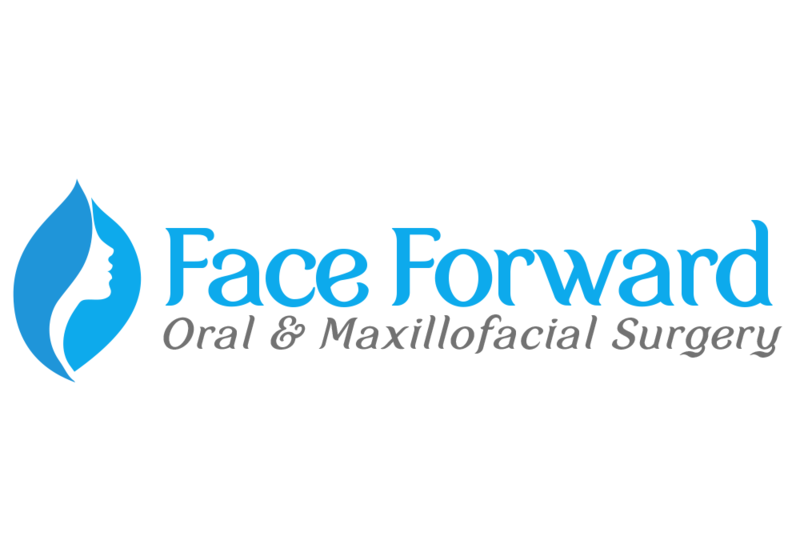 Contact our office today to schedule an appointment with Dr. Darichuk and the Face Forward team. We look forward to meeting you! A native Calgarian, Dr. Lee Darichuk is excited to return home to serve the people of Calgary. Dr. Darichuk attended E.P. Scarlett High School, followed by the University of Calgary where he obtained his BSc degree. He completed his dental degree at the University of British Columbia in 2004 followed by a General Practice Residency at Vancouver Hospital. 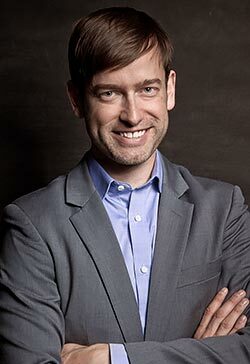 He relocated to Winnipeg in 2005 to begin residency in Oral & Maxillofacial Surgery at the University of Manitoba. In 2009, he passed the National Dental Specialty Examination of the Royal College of Dentists of Canada and was awarded a Master’s degree in Oral & Maxillofacial Surgery from the University of Manitoba. Following graduation, Dr. Darichuk spent time with the Head & Neck Disease Site Group at Cancer Care Manitoba. He maintained a private practice in Winnipeg until January 2015. During this time he enjoyed privileges at the Winnipeg Health Sciences Centre, Seven Oaks Hospital, Manitoba Children’s Hospital, and Victoria Hospital where he practiced broad scope Oral & Maxillofacial Surgery. He is a Fellow of the Royal College of Dentists of Canada, a specialist in Oral & Maxillofacial Surgery in Alberta, and a specialist member of the Manitoba Dental Association. In his spare time he enjoys cheering on the Calgary Flames and Winnipeg Jets, travel, and soaking up continuing education to improve his ability to serve his patients. Call us at (403) 374-6977 to book your appointment today! No referral required. FREE Parking is available right in front of our office.